Just in time for back to school season, employees at J.M. 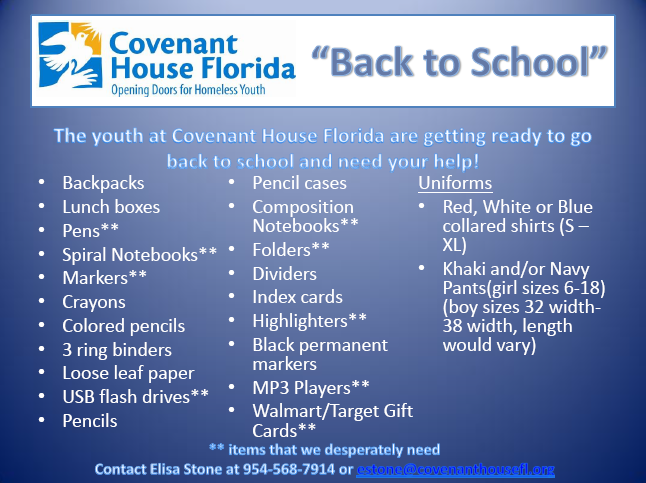 Field Marketing will be donating various materials to the Back to School Supply Drive for Covenant House, an organization that offers shelter to homeless children and runaways in 21 states. The Florida branch of Covenant House, Covenant House Florida, first opened in Fort Lauderdale in 1985 and expanded to Orlando in 1995. This expansion solidified Covenant House Florida as one of the state’s biggest private agencies giving services to homeless and runaway youth. Services include nutritious food, clean clothing, showering facilities, medical attention, and sanctuary from living on the street. Paul Honcharski, account executive at JMF, first heard about the Back to School Supply Drive through the Young Professionals of the Covenant House. Honcharski is an active member of this group of business professionals who raise funds and awareness for Covenant House Florida by attending monthly networking, social and athletic events. Various events include the Fort Lauderdale Bus Loop, Covenant House Florida 5K on A1A, Cranberry Jam, and more. The Back to School Supply Drive will take place Thursday, August 14 from 6-8 p.m. at Fort Lauderdale Beach’s chic S3 Restaurant: Sun, Surf and Sand. Necessary school supplies include pens, spiral notebooks, markers, USB flash drives, composition notebooks, folders, highlighters and more. Participants who provide $10 of school supplies receive free admission, two drinks and appetizers. This event will end right before the start of the school year so numerous children can receive the supplies they need. JMF strongly believes in extending voluntary services to those in the community who need it most. Contact us to find out how you can get involved today!